Author(s): Monica Cantile, Simona Losito, Francesco Longo, Gabriella Aquino, Gabriella Malzone, Franco Fulciniti, Francesco Caponigro, Renato Franco, Franco Ionna, Gerardo Botti. Pathology Unit, Istituto Nazionale Tumori Fondazione “G. Pascale”, via Mariano Semmola, Naples 80131, Italy. Malignant tumors of salivary glands are rare lesions, often with poor prognosis. At present, surgery represents the only therapeutic choice, whereas chemotherapy is employed as palliative treatment in advanced disease. Over the years several molecular alterations associated with the pathogenesis and progression of the salivary glands tumors have been well-characterized. 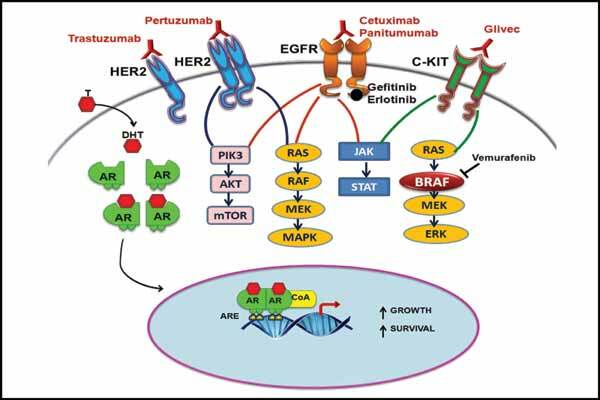 Particularly, the mutational status and/or aberrant expression of certain markers, such as EGFR, HER2, cKIT, BRAF and AR, also identified in some tumor histotypes of the salivary glands, currently represent molecular targets for new and efficacious drugs routinely employed in the treatment of other neoplasias, such as breast, lungs, GIST and melanoma. The expression analysis of these biomarkers associated with histomorphological data, could then provide the oncologist the opportunity to create a proper stratification of patients for customized therapies. This review represents an overview of the lesions of the salivary glands best characterized in terms of molecular aspects, focusing the attention on those markers and molecular alterations which can be important in the diagnosis as well as in the therapeutic stratification of these tumors. Keywords: Malignant salivary glands tumors, predictive markers, therapeutic stratification. Affiliation:Pathology Unit, Istituto Nazionale Tumori Fondazione “G. Pascale”, via Mariano Semmola, Naples 80131, Italy. Keywords:Malignant salivary glands tumors, predictive markers, therapeutic stratification. Abstract:Malignant tumors of salivary glands are rare lesions, often with poor prognosis. At present, surgery represents the only therapeutic choice, whereas chemotherapy is employed as palliative treatment in advanced disease.